There went the neighborhood! Here comes Lincoln Common. 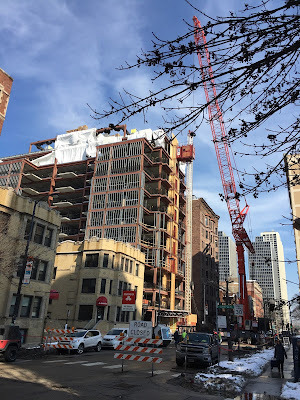 I post these little construction updates fighting back tears. 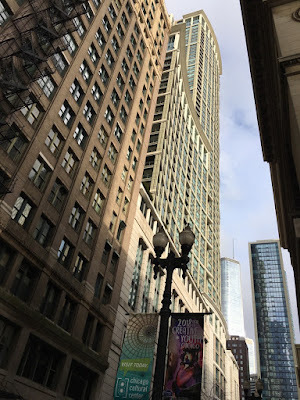 As many of you know my wife worked at Children's Memorial Hospital in Lincoln Park (now a new hospital in Streetrville) and my first offices were located a few blocks away from the site. Many great times and great people! 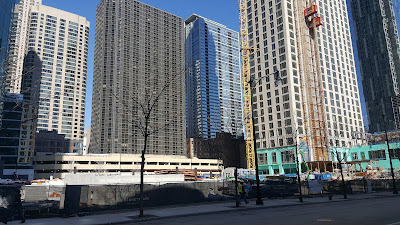 The intersection of Fullertion, Lincoln and Halsted is almost unrecognizable save for the remaining building on the southeast corner. Progress. 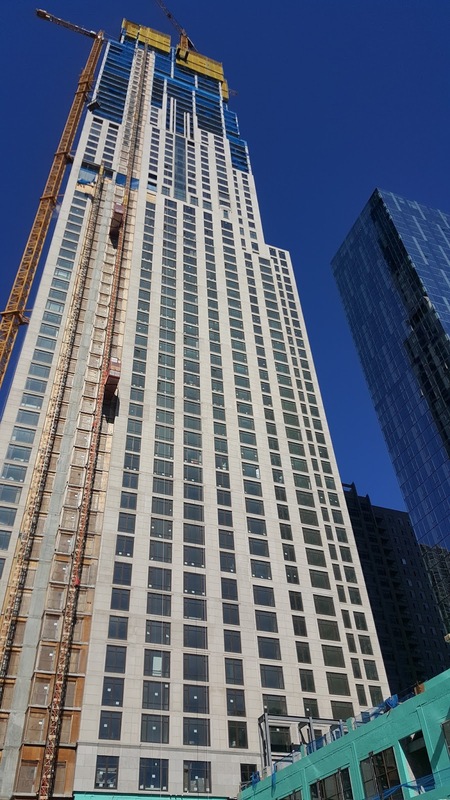 One Bennett Park (451 E. Grand Ave. Chicago, IL 60611) is a luxury new construction condo and apartment tower in Streeterville. 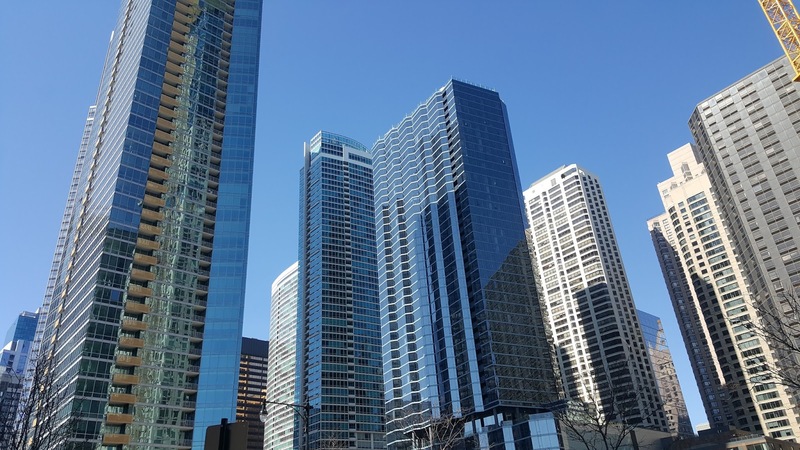 The location, among the many glassy and classy buildings, is close to the lake, Navy Pier and the recognizable Lofts at River East across the street on 445 East Illinois (not so glassy). 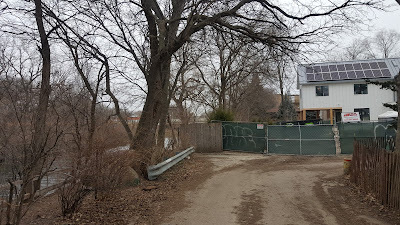 I snapped some photos of the One Bennett Park site on Monday. I'm still amazed after all these years how they build these things in tight quarters adjacent to completed buildings. 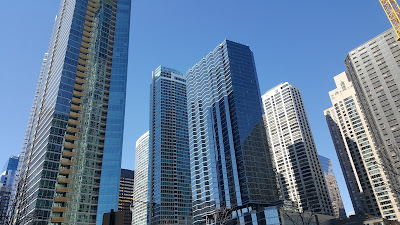 Great lake of shiny glass buildings in the eastern portion of Streeterville near the lakefront. 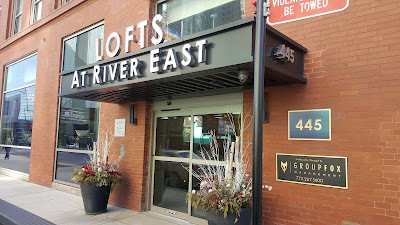 The popular Lofts rental apartments across the street to the south at 445 East Illinois. 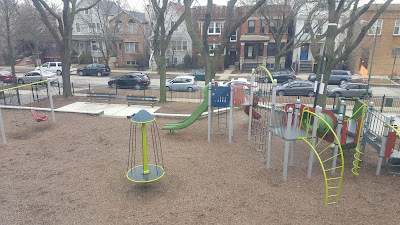 One Bennett Park is also across from the Target store at McClurg and Illinois, Pinstripes, and Cupital. The One Bennett Park site boasts a large central park at the base of the building. MREDLLC.com (our MLS) shows units under contract from $1.8 million to $6.2 million. 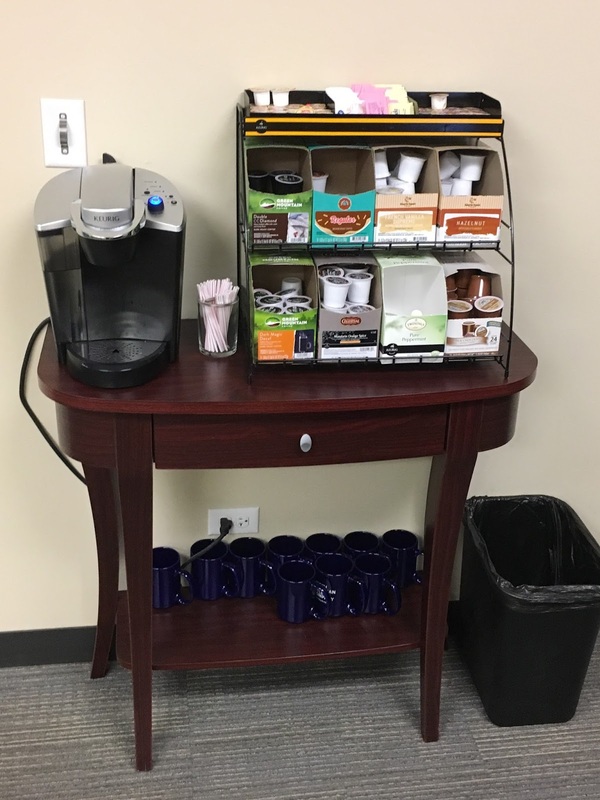 We often visit sales centers with our clients to help them research available options. 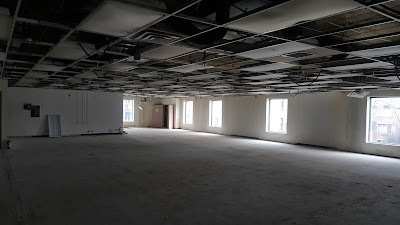 Pre-construction buildings do not typically list all there available units. 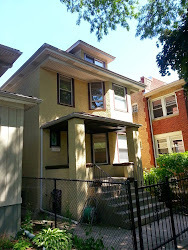 One Bennett Park only shows a handful of listed units on the MLS. 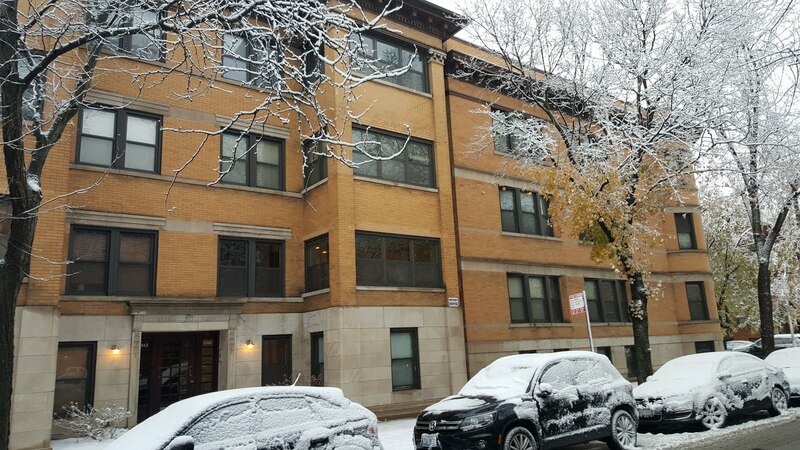 We've been looking for a single family home for our clients in the North Center and Lincoln Square areas. A couple nice houses came up in the budget in the western portion of North Center between North Western Avenue and the North Branch of the Chicago River. The neighborhood also known as "River's Edge" resides in Coonley Elementary and Waters school districts (sales area shown below). 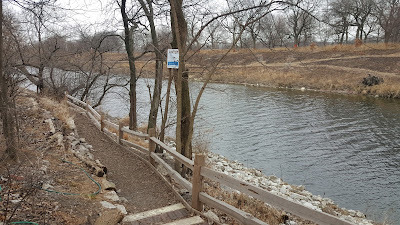 The buyer clients were not familiar with this pocket so I had them take a walk on the river trail! 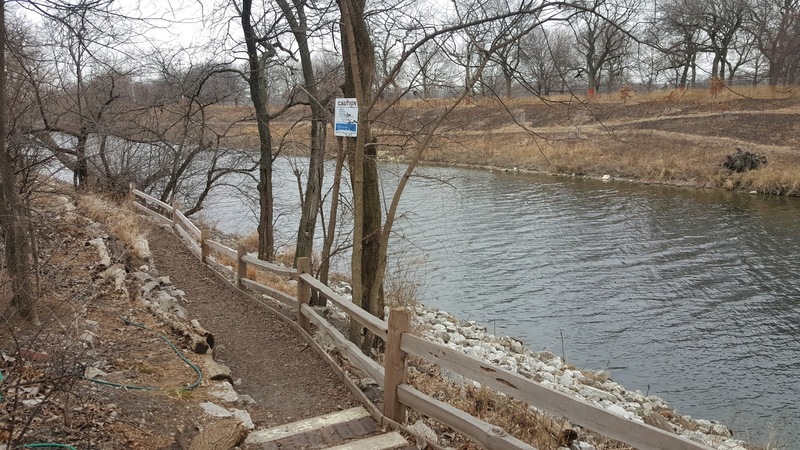 North Center section known as River's Edge along the river. 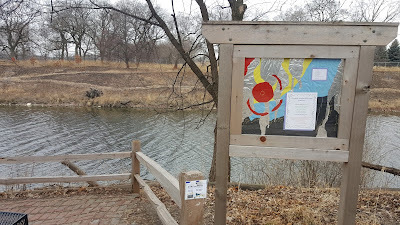 This residential section of North Center enjoys a unique river trail and offers easy access to three large parks. 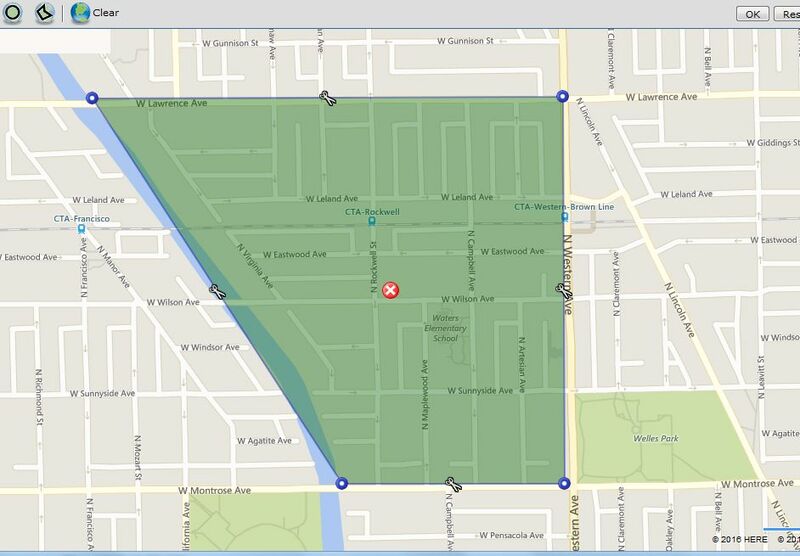 35 single family homes sold in this section of North Center over 2017. The median price of a home sale here is $845,000. 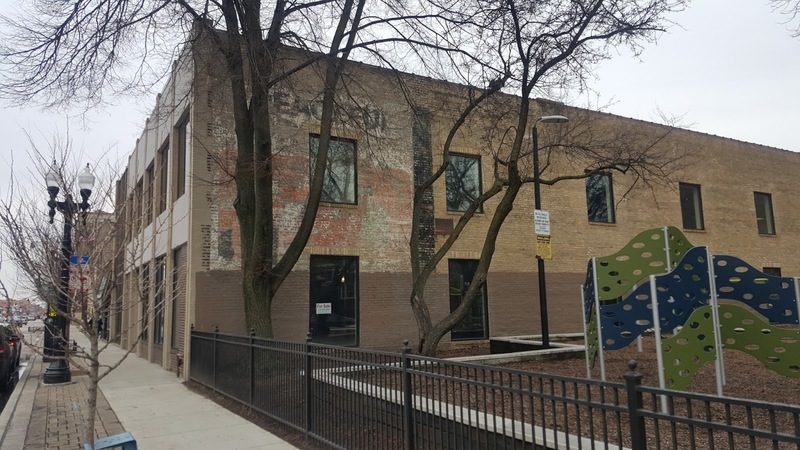 Six small multi-unit buildings sold over the same period with prices ranging from $450,000 for a frame two-flat (most likely a tear down for redevelopment) and $950,000 for a renovated three-flat building with large duplex owners unit. This dream house is under construction along the riverbank... wow! It has my required basketball court already too. This "alley" has the feel of a private country road to select houses. You can see the large luxury home under contract in the background. Eleven condo units sold in this section as well over 2017 with a median price of $315,000. The price and units ranged from a one bedroom at $175,000 to a new construction three bedrooms duplex-down on Western Avenue for $510,000. The access to parks and Chicago Park District programs is most desirable for me personally. Many buyers are desperate to get into a house or condo in a highly rated neighborhood school district. 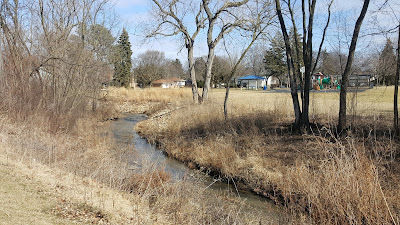 I was in the great Village of Palatine yesterday to evaluate a client's home for sale. The house is in the Willow Wood subdivision which feeds Virginia Lake Elementary School, Sundling Junior High and Palatine High School. Willow Wood sub division is easy walking distance to a Mariano's Market, the excellent main library branch and many stores and restaurants along Hicks / Northwest Highway. 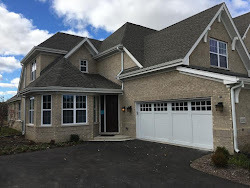 A common model shown above and attractive example of homes found in the Willow Wood subdivision of Palatine. Palatine offers a wide range of homes from the $200s in a central location near highway access, shopping and job centers. 22 homes sold in the Willow Wood subdivision over 2017. The median price was about $330,000. 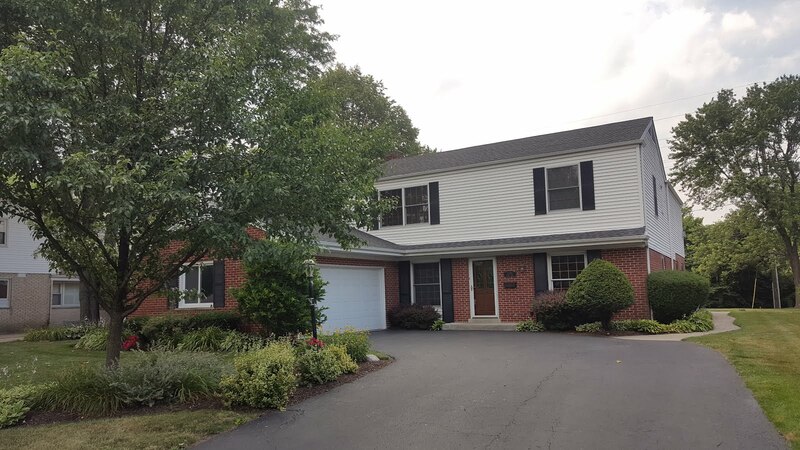 The highest sale was a five bedroom home at 651 N Salem Ct , Palatine, IL 60074 for $432,500. Two homes sold over $400K in the subdivision last year. 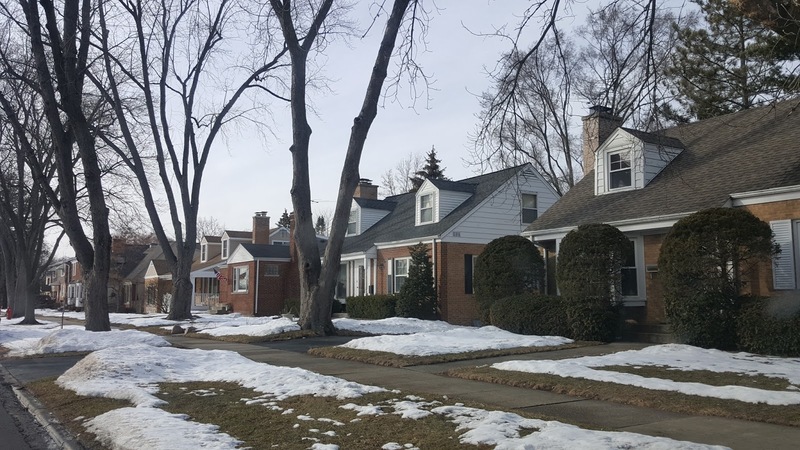 608 single family homes sold in all of Palatine over 2017 with a median price of $320,000. 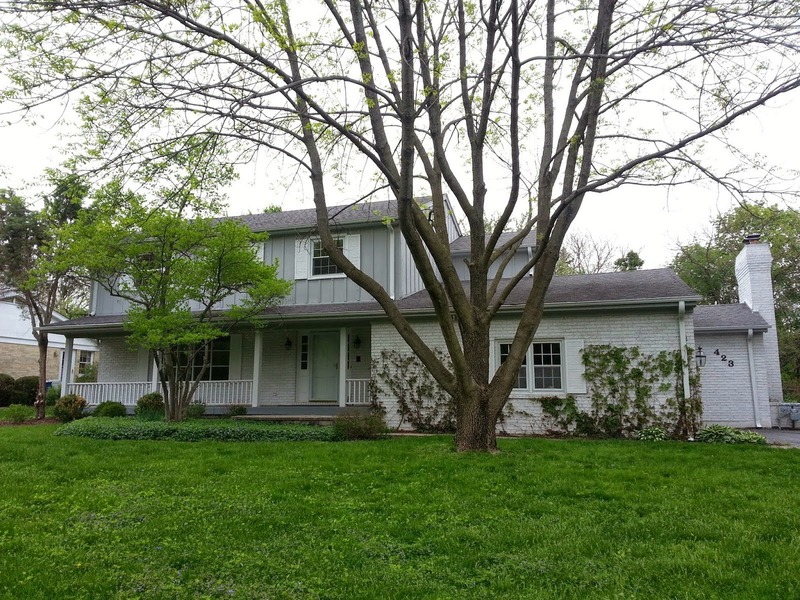 The highest priced sold home was a new construction house at 885 W Kathleen Rd , Palatine, IL 60067 for $836,000. 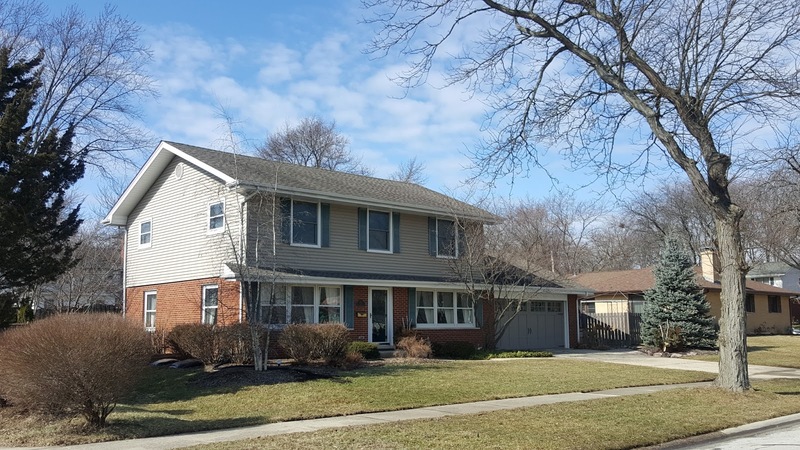 The four bedrooms home in Fremd High School district sold over the list price with upgraded options. In 2016, 587 single family homes closed with a median price of $325,000. 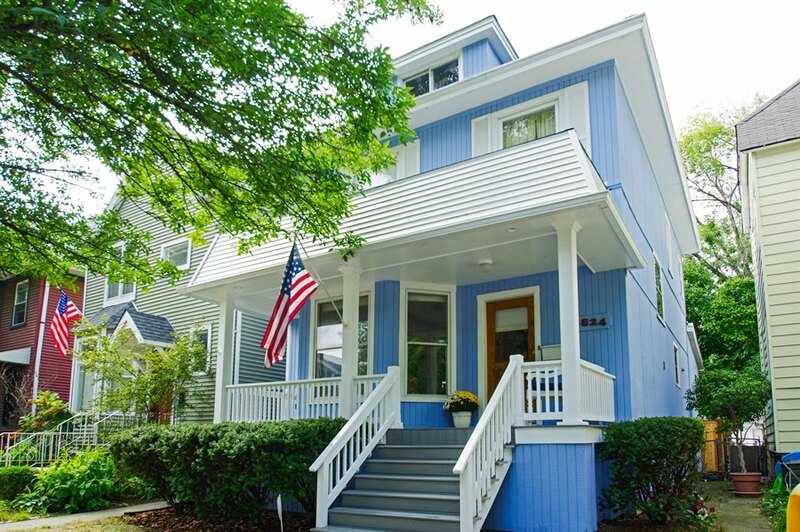 In 2015, 515 homes sold with a median price around $320,000. Interestingly... back in 2012, 613 homes sold with a median price of $320,000 (numbers almost identical to 2017 fivers later). It is rare in most Chicago neighborhoods and suburbs to see such consistent home sale unit numbers and median price over the period 2012-2017. 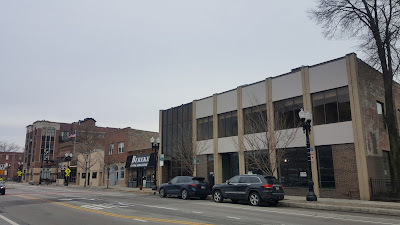 2112 West Lawrence was leased for over 30 years by the State of Illinois. It is now for sale. I took a tour of a large commercial building for sale along the Lawrence corridor in Lincoln Square. 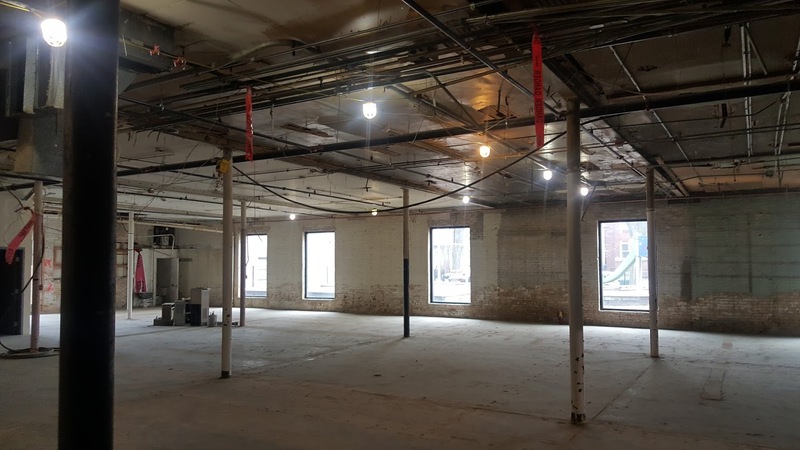 2112 West Lawrence (74'x130' lot, Zoned B1-1) is a two story building in the heart of the rejuvenated mixed use district. No price was discussed. As they say, "If you have to ask...". Broker David Kimball of MB Real Estate did discuss some uses and shared there was interest from day care providers among others. There is interesting neighborhood stats and development information in the property brochure. 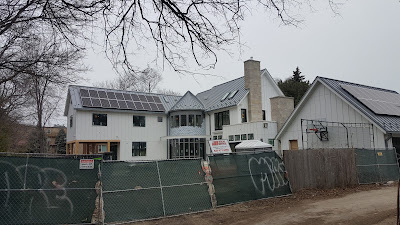 Many of us in the neighborhood have watched the ongoing renovations for some time. The new window installation facing the park peaked my interest in the future use of the building. It makes for a unique aesthetic. Cool looking east side of building adjacent to renovated play lot. Skokie is diverse suburb home to a gazillion brick homes of various styles that fit almost any budget. 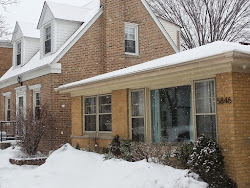 We popped out to Skokie this weekend for house showings. The Village of Skokie is a logical option many of our city dwellers looking for nearby affordable houses and well rated schools (our clients are looking under $500K for a four bedrooms house). 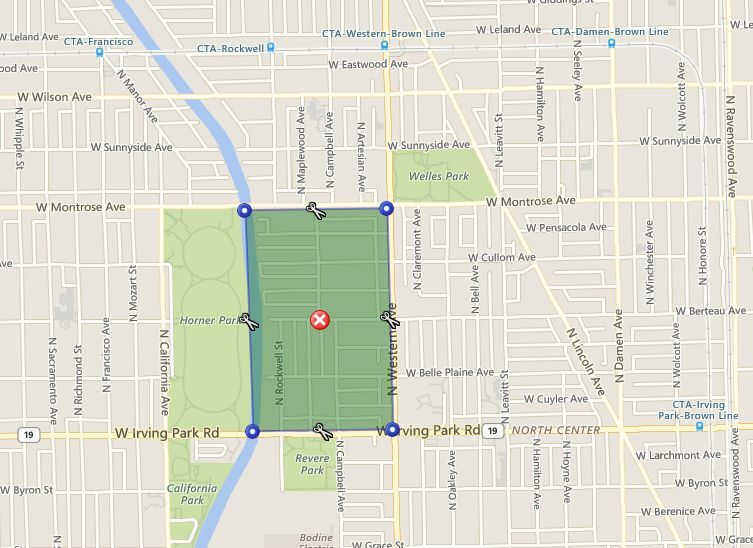 The drive from our client's current location in Lincoln Square is 20 minutes and Skokie is easy to highways. 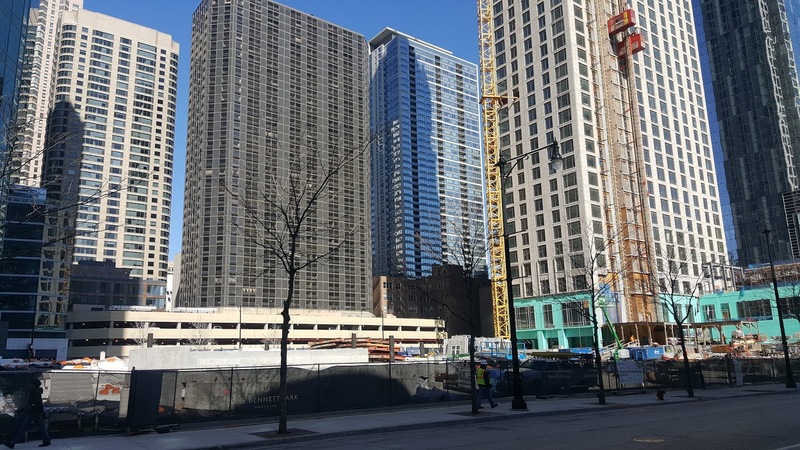 The village has seen an uptick in sales prices over the past five years mirroring many popular Chicago neighborhoods. 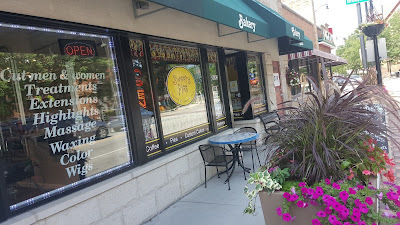 Skokie boasts a true downtown with eateries, services, shops and civic events. 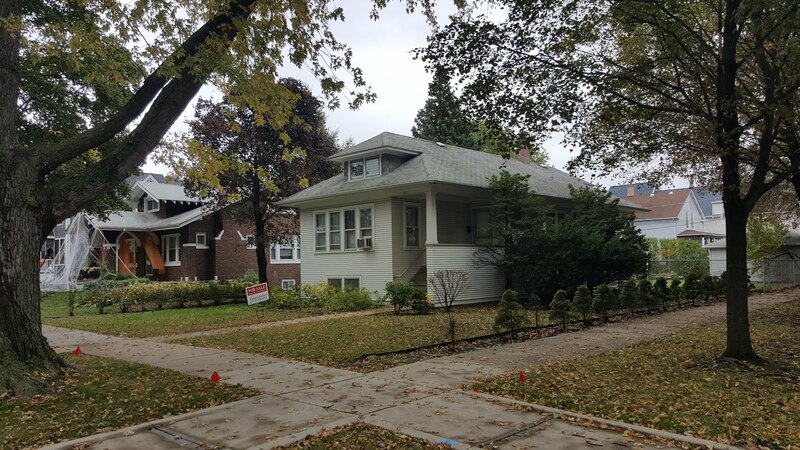 473 single family homes closed in Skokie over 2017 with a median price of $327,500. 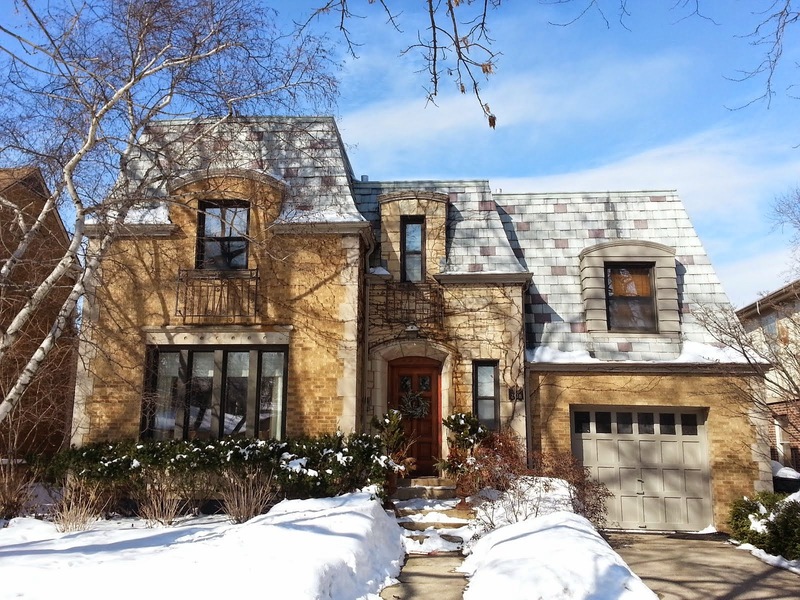 The highest priced home sale was at 4200 Grove St, Skokie, IL 60076 for $1,100,000. Two homes sold over $1M and only 41 homes sold over $500,000. In 2016, 526 homes sold with a median price about $315,000 (that got you a nice conditioned four bedrooms, 2 baths split level in high-rated schools). 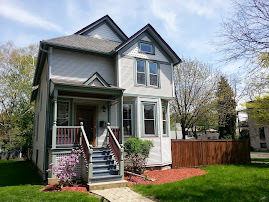 Back in 2012 the median of a Skokie single family home was only $225,000 with a highest priced home sale of $748,000. So far in 2018, 31 homes have closed with median price about $360,000. 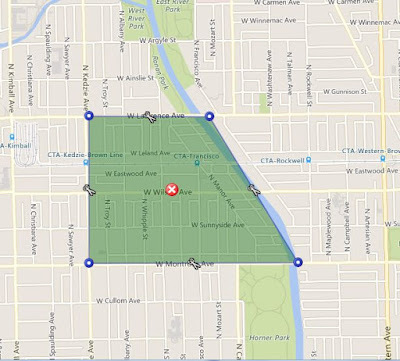 98 homes are currently for sale in Skokie at the time of this writing. Many charming brick homes line West Wilson Avenue in Ravenswood Gardens and Ravenswood Manor. All photos Eric Rojas, Broker, kale Realty. 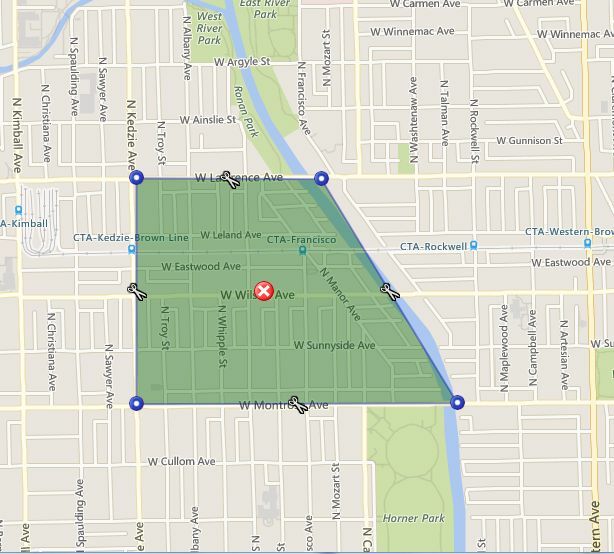 We have several clients aggressively looking for a house in the Lincoln Square area. This includes Ravenswood Gardens and Ravenswood Manor (the Manor is technically in Albany Park but it is associated with Lincoln Square as well). A few houses have come on and sold really quickly in these neighborhoods this February. 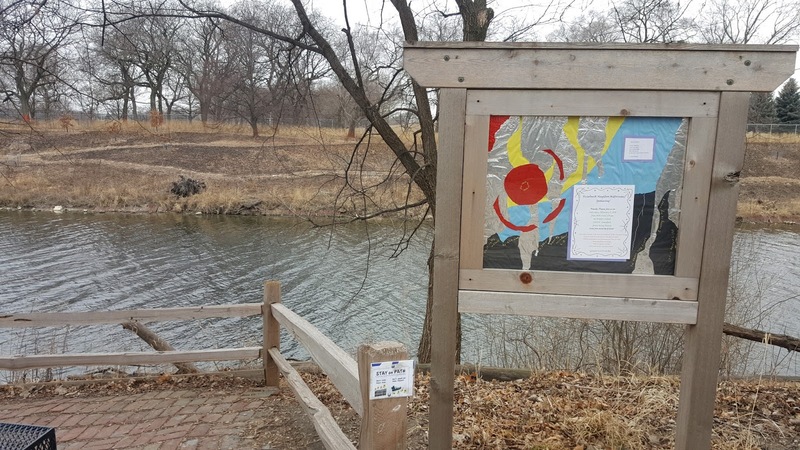 Ravenswood Gradens is a popular Lincoln Square neighborhood west of Western Avenue and East of the river. 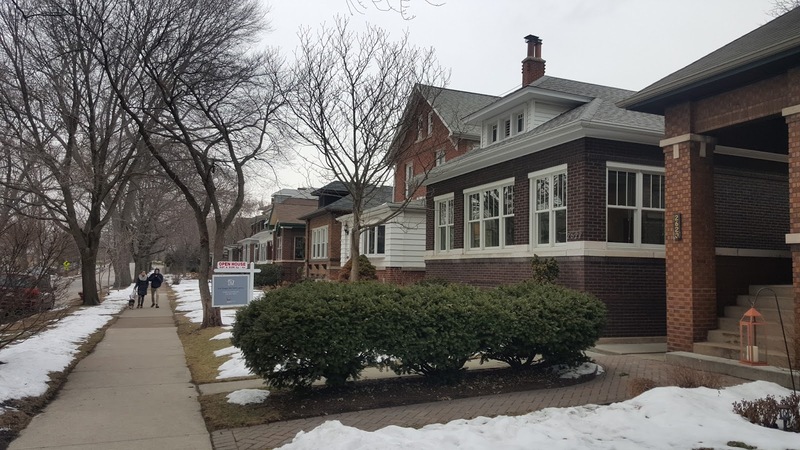 13 single family homes closed over 2017 in the Ravenswood Garden neighbor with a bonkers median sales price of $1,050,000. 11 homes sold over 2016 with a median price of $655,000. Even in high flying 2007 before the financial crash six homes had closed for a median price of $700,000. Seven homes sold for over one million dollars. 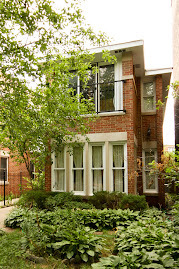 The highest prices sale was a full gut renovation at 2451 W Eastwood Ave, Chicago, IL 60625 for $1,115,000. Six Ravenswood Gardens homes are currently under contract with three of those selling within a week from listing. 20 single family homes sold over 2017 with a median price of about $650,000. 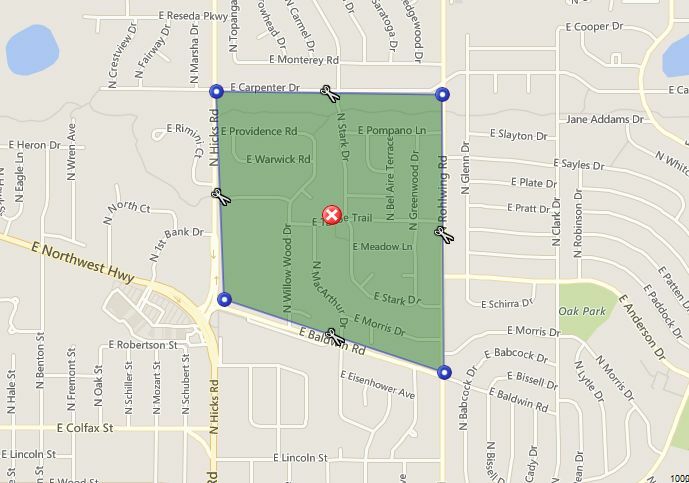 The Manor price appears much lower than their near neighbors to the east. But one story charming brick homes can catch up to $875,000. That's right... no second story. In 2016, 28 homes sold with a median price of $575,000. 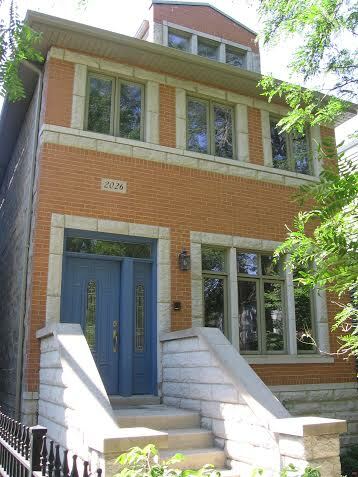 In 2007 before the crash 22 houses closed with a median price of $547,000. 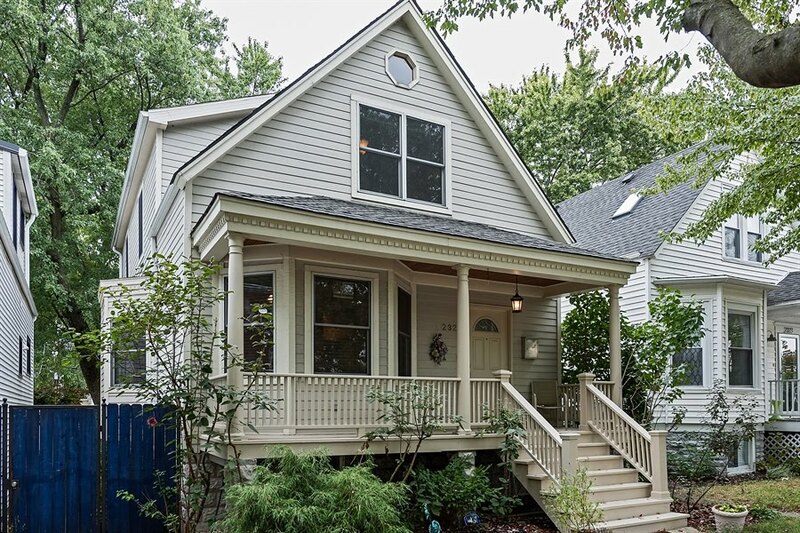 There are pockets of older frame houses that are a little cheaper near the fringes of North Kedzie, West Montrose and West Lawrence that keep the median price down. 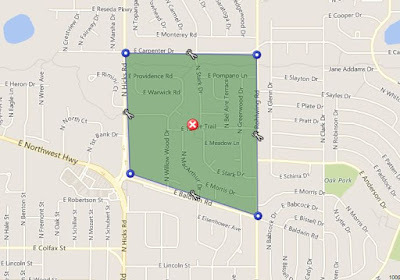 One controversy brewing in the neighborhood is proliferation of new construction homes in this designated Historic District. I was looking at houses in Ravenswood Gardens over the weekend. 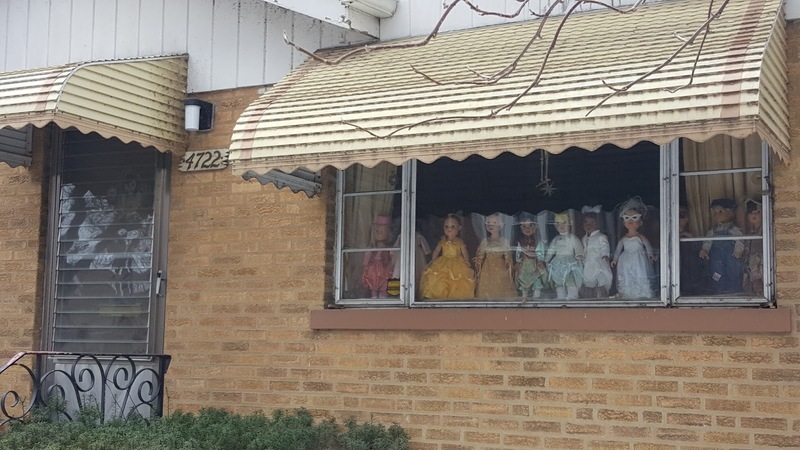 One of the neighbors has made some interesting decor choices. 99% sure the dolls DO NOT come alive at night. I walked by the the recently closed Crate and Barrel store yesterday at 646 North Michigan Avenue. 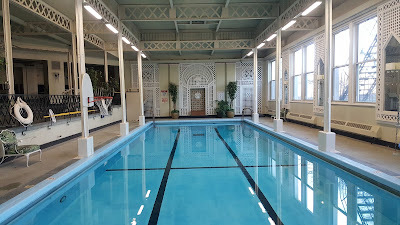 It is the first time I have been by since it has been vacant. The world's largest Starbucks coffee store will move in. The world doesn't need another Starbucks but it will probably be pretty cool and I'll patronize. Sigh. Sold! The Heritage at 130 N Garland... client nabs unit before it hit market! 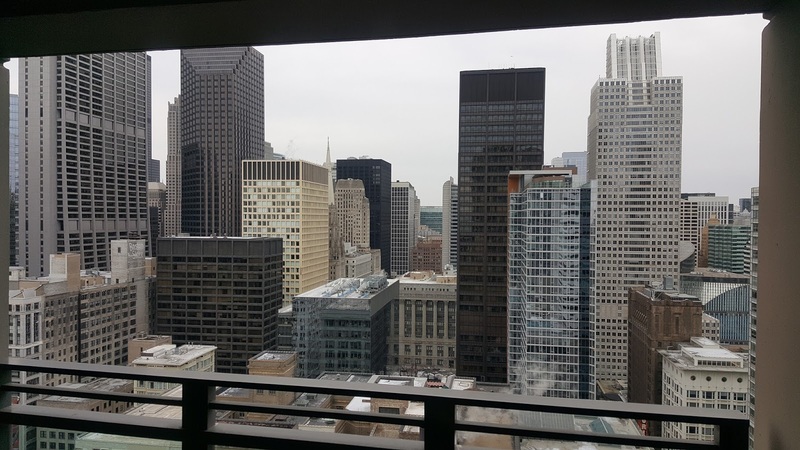 We attended the walk through and closing today for our client's purchase of 130 N Garland Unit #3502... The Heritage! 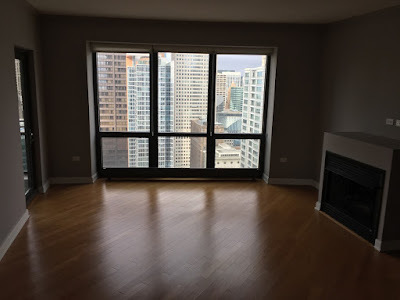 We worked with many great agents, our buyer and private unit owners of a few specific buildings to find a unit that met our client's specific criteria. 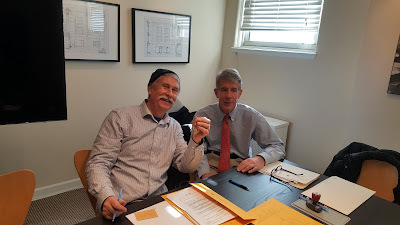 After seven months looking and researching we worked out a deal on a pre-market listing (before it hit MLS)! 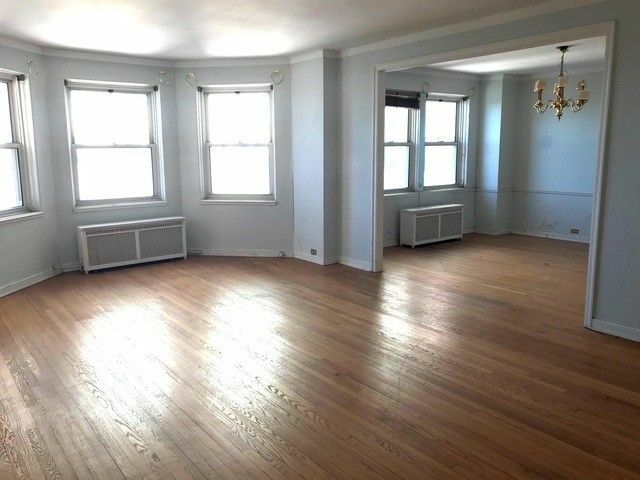 Vacant, clean and no damage! We made sure the unit was vacant and in good condition. Then we headed to the closing to support our client and to produce any needed documentation during settlement. And... for free title company SNACKS! Alas, no cookies today. Congrats to our repeat clients who went from Lakeview town house owners to downtown renters to downtown owners in a couple years! 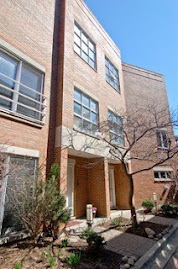 130 N Garland Ct Unit 3502, Chicago, IL 60602 sold for $800,000. 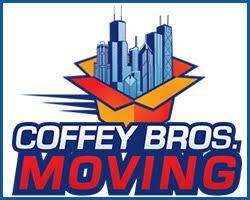 If you are thinking of buying or selling in the downtown area or North Side of Chicago please contact us. Diversey Parkway closings, Yak-Zies closed... everything closed! We were working down in East Lincoln Park yesterday and took a peek at some construction projects. The 508 W Diversey construction is causing requisite chaos along the ever changing landscape of West Diversey Parkway east of Clark Street in Lincoln Park / Lakeview. The large structure also blocks the view of the attractive greystone building to it's immediate east. That greystone of course was home of the recently closed Yak-Zies bar. I don't know if the new construction projects influenced the closing of the long time tavern. Building up Chicago has some real cool pics of the crane rig at the 508 W Diversey construction site. The Hampdens condo project across the street (the cleared site shown above) is boasting 60% pre-sold on their advertising billboards. The very busy Starbucks at Clark and Belmont in Lakeview (3184 N Clark Street) is getting the renovation treatment like so many of their stores. They've directed me to nearby stores. 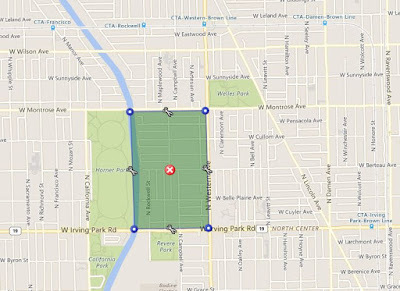 Okay the Lincoln and Damen location is a stretch. 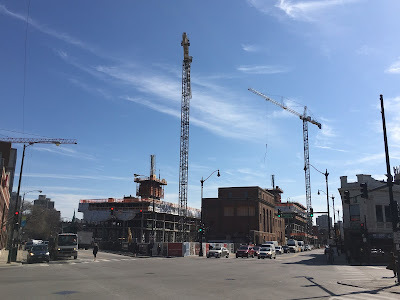 That giant Starbucks at Sheffield and Addison is really weird too. I can't see that lasting too much longer as a regular store concept. Two new construction condo buildings are under development at Orleans and Schiller in the Old Town neighborhood. All photos Eric Rojas, Broker, Kale Realty. 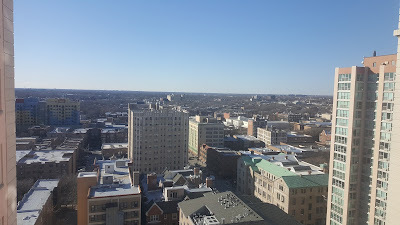 We were in the Old Town neighborhood of Chicago's Near North side last week showing condos. 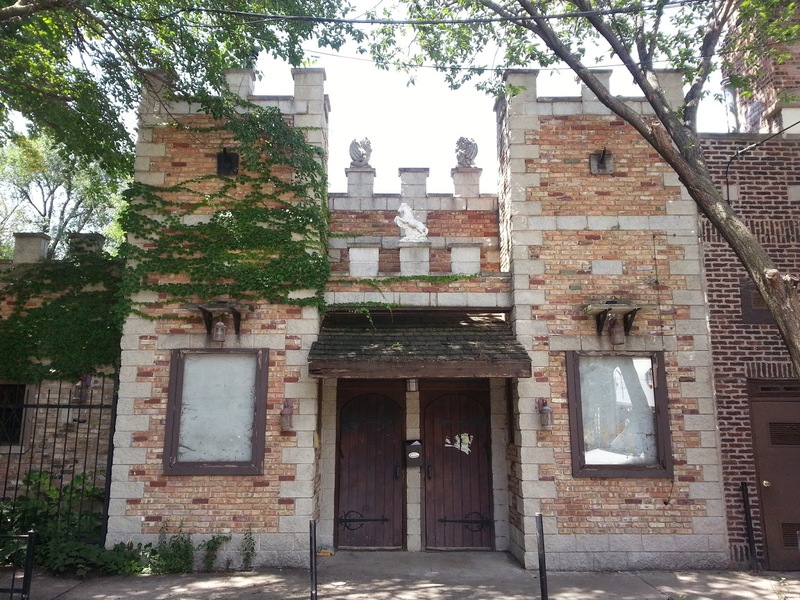 One new and interesting development is on the former Noble Horse Theater and Stables property at 1400 block of North Orleans. 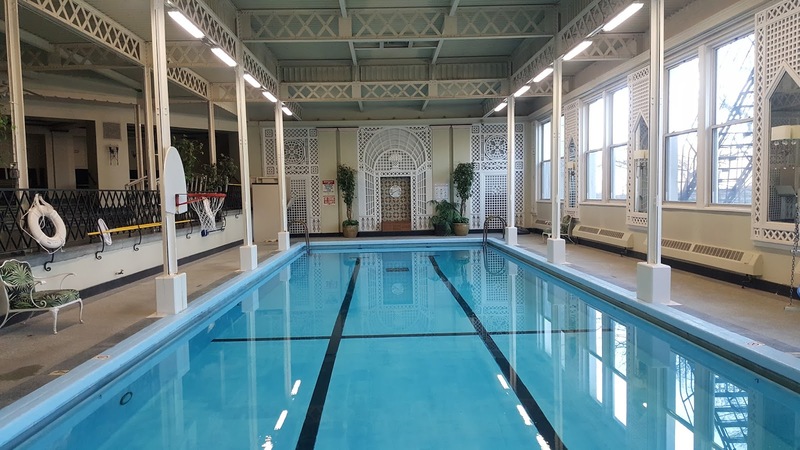 The Equis development (the website has a cool video driving down North Wells on a summer night) offers a more accessible condo building with smaller units starting in the $290s. 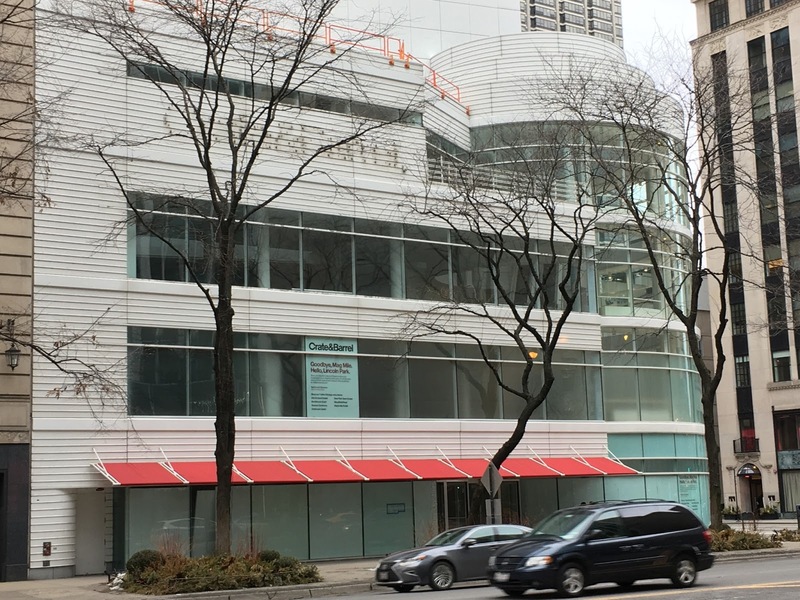 A second tower offers luxury full floor units starting in the $800s. Curbed Chicago has a run down here of late last year. I took photos of the closed down Noble Horse Theater and Stables in 2014 when there was little hope of saving the property. 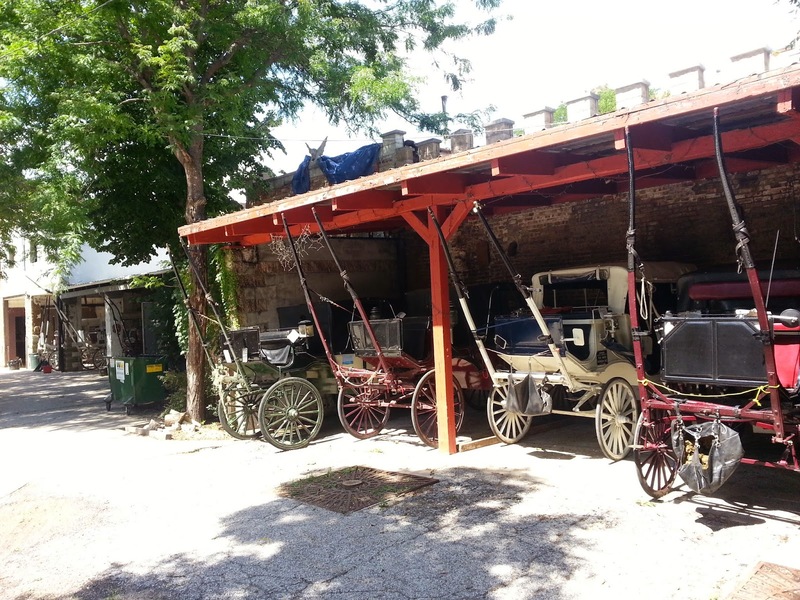 Carriages for downtown rides were still stored on the property. The Old Town towers will afford unobstructed downtown views from many of the units. 204 condos (attached units and town houses) closed in the Old Town footprint (North to Division and LaSalle to Larrabee ) with a median price of about $455,000. 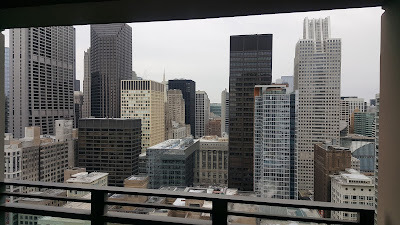 If you exclude high-rise buildings (buildings over 50 units) the median price is $525,000. The highest attached condo unit sale in 2017 was 1418 N LaSalle Street Unit B, Chicago IL 60610 sold for $1,330,000. 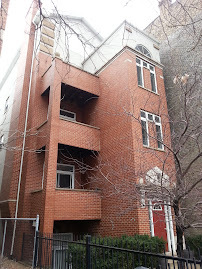 Back in 2012 as things started to get cooking again 168 units closed for a median price of $315,000. 82 non-high-rise units closed for a median sales price of $390,000.